In their first visit to Dunedin the Eagles played to a near to packed stadium last night, with the crowd cheering, clapping and singing in support all the way through an impressive two and a half hour gig. While not an avid fan I like a lot of their songs, and I thought that live they were bloody good. ODT report attendance at 33,000. Earlier in the week they played twice in Auckland. Most of their songs are very well known, which is what everyone wanted to hear. The Eagles have many big hits, and they were all played professionally as well as with pride and energy, but one that I had not hear and still don’t know the name of, that followed a rapturous reception for Hotel California, was one of my favourites. I was sitting high in the south stand, a long way from the stage at the east end of the stadium about 100 meters away, but the three large screens ensured I saw enough of the action. The sound quality was very good, with vocals and and instruments coming through clearly, and the bass drum bang on the mark for oomph and feel. This is a huge credit to those who set up the sound system. The stadium must be very difficult to deal with, being a large and oddly shaped enclosure – at rugby matches it has a large swimming pool type crowd echo. Sure there were some songs that were just ok. The Eagles cater for a wide range of musical tastes. But there were enough highlights to make it one of the best concerts I have been to. 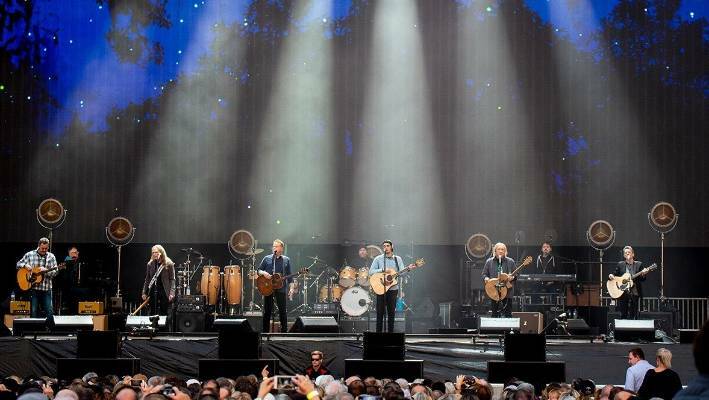 Apart from having great songs the Eagles are a bunch of very accomplished and multi talented musicians. Five of them shared lead vocal duties with all joining in backing harmonies. Their contrasting vocal styles add to the variety and interest, from crooners to the more rough rock of Joe Walsh, who also lifted the act with his lead guitar. Drummer and sometimes guitarist Don Henley, guitarists Vince Gill and Deacon Frey, and bassist Timothy B. Schmidt all had turns in the spotlight. Henley formed the Eagles in 1971 with Glenn Frey, who died in 2016 and has since been replaced by his son Deacon (who fills his shows very capably) along with Bernie Leadon and Randy Meisner. Walsh replaced Leadon in 1975, and Schmidt replaced Meisner in 1977. Gill, who has a long musical history of his own, was enlisted in 2017. Apart from the youthful Deacon Frey the Eagles are all old rockers. Henley, Walsh and Schmidt are all in their seventies, and Gill is about a decade younger. But their voices and energy still keep the Eagles up there with the best. It was a very enjoyable evening. There’s other music I listen to more than the Eagles but they were still well worth hearing live – it was better than recorded versions. I’ve worked out what the penultimate song was from set lists from earlier in their world tour – it looks like it’s the same as last night, even the encore and encore #2 charades are the same. One of their rockier numbers, a style of music I prefer. That video performance looks much the same as last night.